CHEM 4000 and BCHM 4000 talks this week: Check out some of the research activity going on and see if these courses are for you. Consider planning next year's course selections. Book an appointment for help with your planning. Come visit us at the Spring Open House! Chemistry has made extraordinary contributions to the betterment of humanity. Ammonia synthesis in the early 1900s led to fertilizers and enabled modern farming and the food supply for billions of people. Penicillin, discovered in 1928, and other antibiotics, provide effective treatments for bacterial infections and helped save millions of lives. The screens of computers, TVs, and phones, are made of liquid crystals, electroluminescent molecules, OLED polymers, and other advanced materials synthesized by chemists. The creations of chemists are everywhere: in water purification, air quality monitoring systems, plastics, explosives, dyes, glues, paints, solar panels, vaccines, vitamins, and a multitude of pharmaceutical drugs. The solution to many pressing problems lies in better chemistry, and better use of chemistry: biodegradable plastics, targeted drugs with fewer side effects, better car batteries, cleaner energy sources. Current research in chemistry may sound like science-fiction, with smart materials, molecular engines and nanorobots 1000 times smaller than the diameter of human hair, bioengineered tissues and organs, and drugs that reach targets in the body with exquisite precision. Chemistry is exciting, it continues to flourish and grow into new areas. We invite you to be part of it. Our Department is proud to offer innovative degree programs that are interesting, challenging, and prepare you for career opportunities after graduation. Two recent degrees, the stream in Pharmaceutical and Biological Chemistry and the degree in Biochemistry, have become tremendously popular. A new degree introduced in Fall 2017, the Honours Major BSc in Biochemistry can be combined with studies in other subjects and provides a more flexible alternative to the Specialized Honours degree. 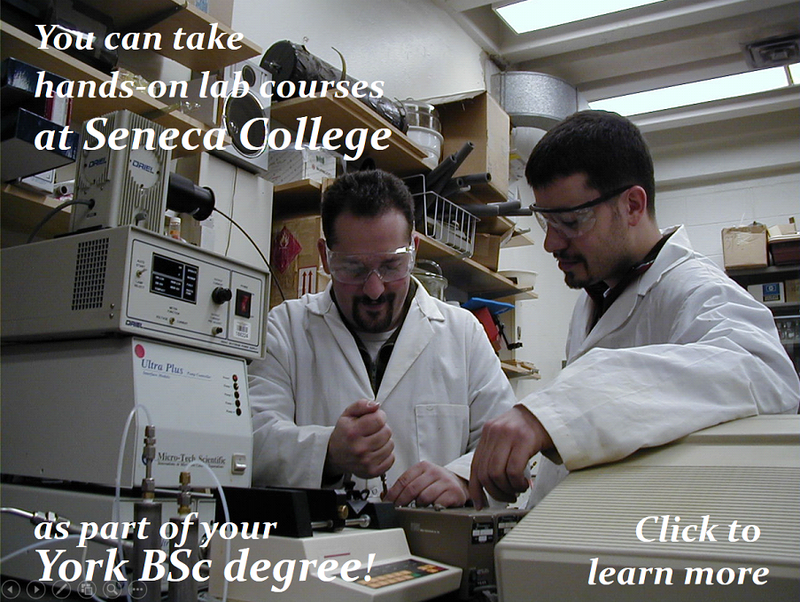 The York-Seneca Coregistration program, which we launched in 2017-2018, allows Chemistry Honours Major students to take up to five industrially relevant, hands-on courses at Seneca College and have them count toward a York degree. We also offer optional course sequences focusing on Materials Chemistry or Analytical Chemistry, both industrially important areas, as well as several other degrees. 2020 and 4051), Assistant Lecturer Stephanie Pugliese (teaching CHEM 1000 and NATS courses) and Trevor VandenBoer (teaching CHEM 3080), all doing exciting things in atmospheric chemistry, materials chemistry, synthetic chemistry and synthetic evolution. And we look forward to three more appointments in 2019! Our ambition is to provide you with a rich education that extends beyond the classroom. The Seneca Coregistration program is one example. Another is our popular fourth-year Research Project course where students interact personally with their supervisors and carry out cutting-edge research in their labs. Many of our students take on summer or part-time employment and volunteering opportunities in our research laboratories. Others do internships in industry or participate in student-exchange or international internship programs. You can peruse the profiles of our faculty members and their research activities on our website. Whatever your choice may be, our degree programs will prepare you well for a variety of careers in education, government and industry, for graduate studies and research, or for entry into medical, dental, law, business and other professional schools. As Chair of this Department, let me offer you my help in making yours the most rewarding and enriching undergraduate experience you can get. The staff of the Chemistry Office and the Chemistry faculty members are available for advice and help. Chemistry continues to captivate students and faculty alike. I invite you to make full use of what we offer! As part of the Chemistry Department's commitment to offering useful and high-quality degrees, our programs are continually evolving. The Chair's message above highlights two recent initiatives that provide exciting opportunities for our students. As well, we continue to support the growth of our Co-op program. Meanwhile, we have been teaching differently and better, thanks in large part to transformative efforts by our two energetic Assistant Lecturers, Hovig Kouyoumdjian and Derek Jackson. This year we welcome a new Assistant Lecturer, Stephanie Pugliese, to our energetic young teaching team. We recognize that students often come to university not knowing what to expect, not knowing their options, not knowing the rules or deadlines, or not knowing exactly what they want from their university experience. Some students hear different things from different people. We have launched four new facilities that extend our ability to deliver the accurate information that students need: First is the Personal Advisor, a utility to identify and address many common issues encountered by students, ranging from complaints to career advice, from academic troubles to enrollment troubles. Second is the Progress Monitor, a complete update on the earlier facility that enables students to quickly and accurately monitor their academic progress in their degree and their performance, as well as to keep track of the requirements that they still need to fulfill. It also helps to project into the future by testing multiple "What If?" scenarios. Finally, it is now much faster, easier and more convenient to book an advising appointment with our self-booking facility. All of these developments continue to speak to our commitment to delivering a quality and satisfying experience for all students. 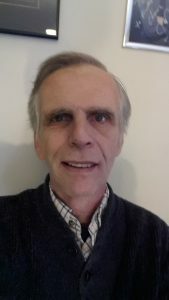 Part of my job is to provide you with the most complete information on our programs and offerings, through this web site and elsewhere. I welcome constructive criticisms and suggestions on how we can improve any aspect of the undergraduate experience, so feel free to visit or to email me at chemupd@yorku.ca with your ideas or concerns. In the meantime, I wish you a very successful and productive year!